Surely, you have heard of Iguazu Falls in Southern Brazil and how it borders Argentina, but did you know Brazil shares another behemoth creation with its neighbors? 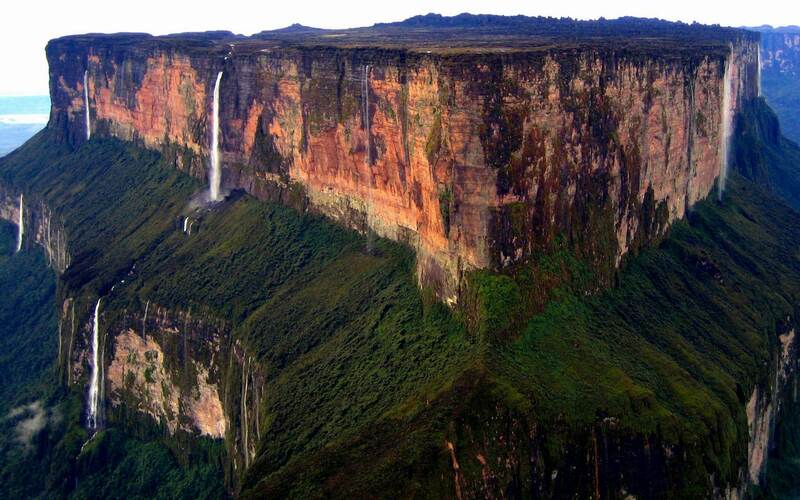 Mount Roraima spans three countries (bordering Venezuela and Guyana), is said to be around 2 billion years old and, if that’s not impressive enough, has cliffs that stand a quarter-mile high. Much like its Australian cousin, Uluru, Mount Roraima is central to the local indigenous population’s spiritual beliefs. They gave the name of Roraima (roroi + ma), which is also the name of the Brazilian state that borders it, because in their native tongue, it means the “great blue-green”. The vistas which the plateau affords may resemble something straight out of Jurrasic Park, and for good reason. Steven Spielberg’s 1993 hit film was inspired by Sir Conan Doyle’s The Lost World, which in turn was inspired by botanical drawings done by one of the first people to scale the mountain. Much like the dinosaur fossils that must abound in the rock formations, the plateau itself seems equally stuck in time. For a Brazilian video web-series on Mount Roraima, click through to Vimeo.